SF-CHRP believes that the struggle for protection and advancement of human rights in the Philippines is a struggle that is connected to the overall Philippine people's movement for national sovereignty and genuine democracy. 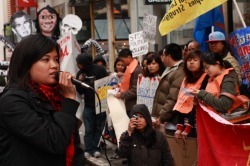 SF-CHRP educates, activates, and organizes Bay Area communities to promote the civil and political rights of the Filipino people, as well as support the human right struggles of all people. RESEARCH & EDUCATION – SF-CHRP conducts research, discussions, and educational workshops on human rights, U.S. militarization and intervention in the Philippines and the socio-economic conditions of people in the Diaspora. 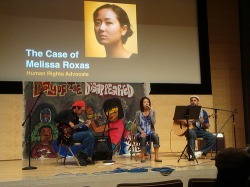 PHILIPPINES EXPOSURE PROGRAM – SF-CHRP facilitates community exchange and exposure wherein Filipinos and non-Filipinos in the Bay Area can see and learn firsthand the human rights situation in the Philippines. Individuals and groups who have limited knowledge of the conditions of Philippine society may also request to go on a basic reality tour. HUMAN RIGHTS FACT-FINDING MISSIONS – SF-CHRP also facilitates writers, artists, legislators, lawyers, and faith-based individuals and groups to participate in-fact-finding missions to help document human rights violations going in the different villages and help educate the U.S. public and policymakers on human rights violations occurring in the Philippines. ART, FILM, MUSIC & CULTURE – SF-CHRP brings together artists, filmmakers, and other cultural workers to create and develop art, film, and music to raise awareness about the human rights and socio-economic conditions of the Filipino people. Artists are also encouraged to donate their time, skills, and art to fundraise and generate material support to impoverished communities throughout the Philippines. In addition to the aforementioned, SF-CHRP is equally committed to organizing and mobilizing the general public with campaigns to protect and advance human rights in the Philippines.